This thread will list feedback and bugs associated with hideouts that myself and other players have. Jun's portals are the only ones that require a set amount of space before she can spawn them. Both the map device and Alva do not have this requirement. Furthermore the amount of space she requires is excessive. Having chests that don't have animations would make it easier to cover them up. Furthermore having a larger stash decoration will allow for more people to access it if placed against a wall or something. 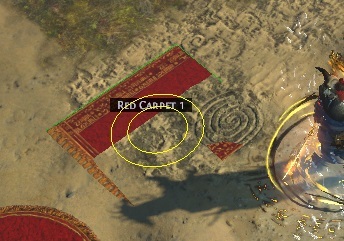 The decoration limit is still an issue with many people and the larger size of many hideouts hasn't helped. One way to help with the decoration limit would be to add additional variants for some decorations to cover more area. This would be helpful with decorations that cover the ground, such as Rubble Strip, Red Grass, etc. It would also help with widely used wall decorations such as pillars. Similarly, adding more floor decorations will help reduce the decoration limit as well. There aren't many floor decorations currently. It would be good to have more options for light sources. The vast majority of lights are orange or warm colored and we have a very limited selection of cool light sources. It would also be nice to have light sources that aren't physically tied to something, similar to the Wide Light Beam MTX. Covering walls or edges is extremely difficult due to decorations needing to be placed on walkable terrain. Walls like those in the Skeletal hideout are pretty much impossible to cover because of the small shelf near the walls. Allowing us to place decorations closer to walls and edges will open many more creative opportunities. Things like the Fellshrine Ruins in Unearthed hideout or the excessive amount of colossus and tree decorations in Arboreal hideout do not provide any benefit for us and only serve as annoyances. This giant thing gets in the way of screenshots. Currently we must search for decorations by name only. Allowing us to search by both category and/or tags (such as wood, metal, etc.) will help us find decorations easier. We now have categories for decorations. Please let us filter them by category and/or master. This will let us know how close we are to the limit. Allow us to view the portal locations of Jun, Alva, and the map device so we know how to build around them without having to open portals. Favor is in a bad state right now. Thank you for this post, I agree on everything you've said. I don't even know if I need to add something, you expressed all thoughts I've had while I was working on my h/o. Hope that GGG and other players will notice that post, you worked on it pretty hard. EDIT: I actually have to add that I would love if flat decorations would adapt to ground they are placed on. Even if GGG will make uneven ground flat, there still are stairs and passages between different h/o levels. i am here to support this thread!!!! yes we need a fix to my friend the wide light beam! non-flattened ground is so frustrating!! !